Taste the Best! 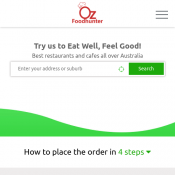 15% OFF ($100 Min Order) On your First Order with favourite Restaurant, Use Promo Code OZ015. When you pay online.T&C – This offer is applicable to only Oz registered users.